So here is another funny past about my baby. In case you are wondering, yes, my other kid does funny stuff but more of it is the kinda thing where you had to be there. My baby loves to go to bed late, really, REALLY late, early-the-next-morning late. We manage but I have learned the hard way when he is ready for bed, he sleeps better and longer if he eats right before bed. So I gave him a banana and while I was in the fridge (getting a drink, not the banana! LOL), I noticed we still had some chocolate cake! Hmmmm, midnight snack! OK, later than midnight but it’s an expression people! lovin’ kid after my own heart, eh? So we share the cake, bite for mommy, bite for baby, as long as he is ready for it. So he gets the second last bite and I start to scrape some errant icing off the plate to go with the last bite, which is supposed to be mine if all’s fair! As I go to eat the last bite, he looks up at me and says, “Happy?” Awwwwww! How could I resist? I mean, I did think about it but my kids are marginally more important to me than chocolate. HA HA LOL! Y’all know I’m kidding! Of course I gave him the last bite!! So this card was inspired by Spencer! I decided to make a mini box of chocolate for the front of the card. Each chocolate inside is paper pieced with silver paper with silver embossing for the foil wrapper and chocolate chip ink on cocoa paper for the chocolates. I cut the chocolate out with some extra at the bottom. Then I actually slit the silver layer in a zigzag pattern (like the edge of the foil wrapper) and put the ‘chocolate’ inside it so it is a bit more 3 dimensional. Oh, man! I just thought of an even better way to do the chocolates! 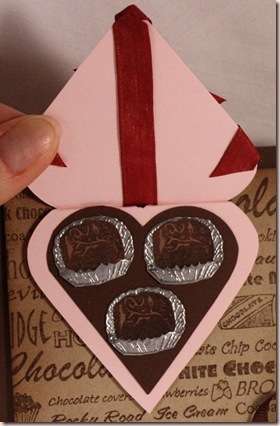 I am going to replace the plain inked chocolates with chocolate embossed ones so they look shiny! I finally found dark brown embossing powder at ScrapFest. It is too late to make new chocolates now so I will add a photo of them later today. The box itself is made from three heart shapes cut with my Coluzzle. The inside heart is cut smaller to look like the liner. I’ve never actually received the cheesy heart-shaped box of chocolates so I had to guess what they look like inside! Stamps: Rubber Baby Buggy Bumpers except ‘happy’ by SU! Accessories: brown grosgrain ribbon-SU!, foam dots and circle red line tape-Jody Morrow, Copic marker (colour ribbon), white taffeta ribbon-SU!, striped ribbon-Sharon Johnson, tab punch-SU! P.S. I got your e-mail. I’ve just added you to my Google Reader, and am looking forward to more “beginners” posts. Thanks!!! That’s an adorable story, and that card is amazing! 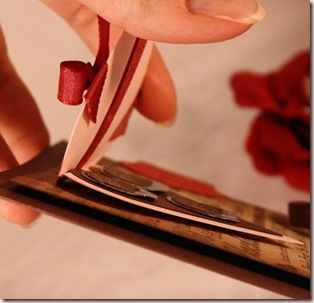 I’ve only recently begun exploring what cards and ink stamp projects people are making and posting on the internet, and I’m truly amazed. Just love it — great use of those wide stripes! What a cute story and a really sweet card! Happy Mothers Day!!! 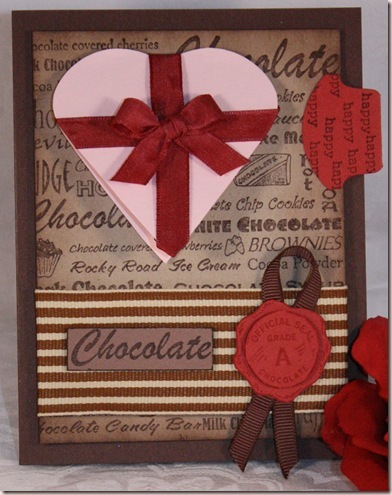 That little heart chocolate box is such an awesome idea!